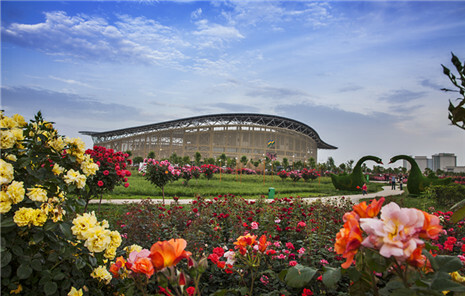 Work on Wancheng Exhibition Park in Nanyang Rose Garden was completed, with its characteristic architectural styles standing out among the colorful roses. 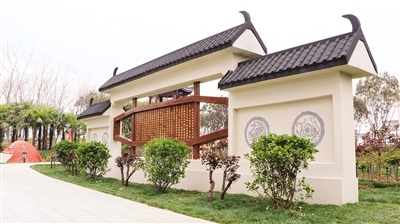 Occupying some 929 square meters, the new exhibition park is adjacent to villages to its back and surrounded by Xichuan, Fangcheng, and Dengzhou parks on the other three sides. Wancheng Park features traditional Chinese culture and integrated the iron smelting and farming cultures. As Nanyang is regarded as the hometown of Liu Xiu, founding emperor of the Eastern Han Dynasty (25-220), the new park is decorated with unique cultural symbols, such as the Hanque, an ceremonial gate tower that gained its popularity during the Han Dynasty (206 BC-AD 220). There is also a miniature Wangfu Mountain on the site, a reference to the original that was made of rockery in 1391 of the Ming Dynasty (1368-1644). To highlight its cultural characteristics, all the landscape lamps in the park are designed in an ancient style and made of copper. Wanchang Park is also dotted with arbors, shrubs, flowers, and small fountains.